Some changes were made on the Supertest. EDIT: The Russian image this all was sourced from was a bit off, so here’s the translated one. Yeah thats definitely a 20-pdr they are giving it. Do the same for FV201(A45) and we’re in it. Actually, whoa, a 20pdr with 280 alpha? That’s new. Probably a 32pdr, but then they should be buffing all 32pdr pen and damage to this level. Since both the AT-15 and the Tortoise have a 32pdr…. 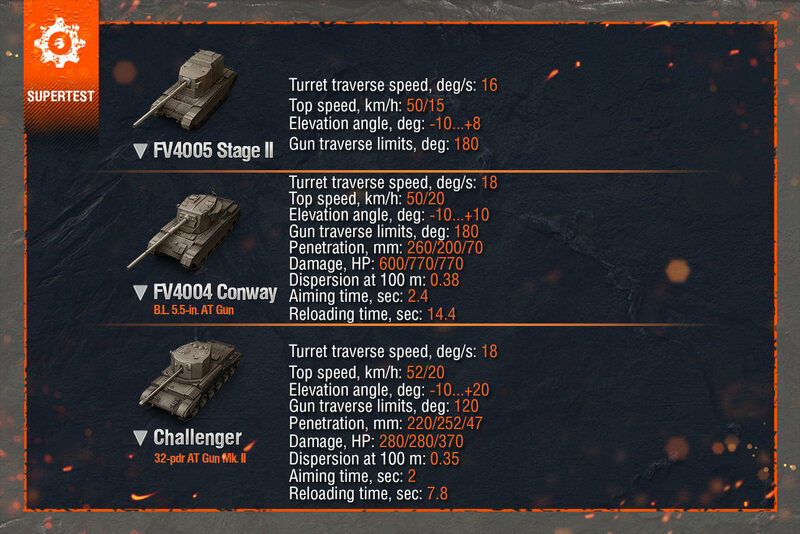 LOL WHAT, 50kph Shitbarn and -10 gun depression Conway?! They should give the FV4005 the 180 degree arc and 7 degrees gun depression it had on sandbox. Why peoples play with shitbar, when death starr is available? You could play the War thunder fv4005, which has a fully traversable turret. Actually, we don’t know that. Even Listy said he’s not sure, and nobody is actually allowed to inspect the vehicle at the moment either. Plus, the thing probably would flip over from the recoil if it fired in any direction but forwards, that thing on the back is there for a reason. KV-2 with derp gun would flip on it’s side if it tried to fire the gun directly sideways, and yet it has 360 degree traversable turret and in the game it can fire at any angle. It was able to rotate fully, it just couldn’t fire behind itself..
Do you have any source for that? Because the last time I heard, nobody was sure as the documentation was vague about it. Forgot if it was Listy or another person in another private group chat. I went to shitbarn cuz I don’t want to grind another british masochists line I don’t want to experience the horrible grind to get to fv215b 120. I’ve been holding off on buying the Conway…guess it’s time! MrConway just posted details in this thread. He said there are more changes coming. Notice -10 on all vehicles and 180 turret on FV4005 with speed and turret traverse buffs on Conway and FV. …not sure how to feel about WG giving massive depression buffs to so many tanks that obviously can’t realistically have it lately. Especially on FV4005 I can’t help but think it’s absolutely ludicrous, plus unneeded with the speed buff and now fully rotating turret? Interesting buffs to the shitbarn. Though, if it goes live, it will pretty much makes grille obsolete. Could those changes come to 9.20 patch? No more conway grind until this hits live…. FV201 has the same gun as the TOG II, yet it is worse in pretty much all the ways it counts. The turret can be easily penned and the hull is a joke like all british armor. It should be buffed in terms of gun handling, DPM and turret armor. And will the gun depression be buffed for all guns? or just these new ones? The turret traverse is anyway a horror on those tanks, better to traverse the whole tank anyway. Strange that the Charioteer is not getting the same -10 gun depression. My fave out of the line.